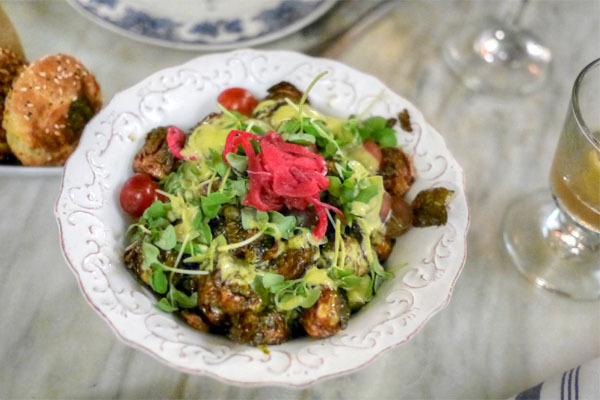 After downing steak frites at the nearby L'Assiette, we moseyed on over to Harlowe, one of the most buzzy Los Angeles bar debuts of 2014 (it opened in May). Originally slated to be called Clementine, Harlowe is the latest project from the 1933 Group, the parent company behind the likes of Sassafras, Thirsty Crow, Bigfoot, Oldfield's, and La Cuevita. Kyle Ackley (Bigfoot Lodge, Drago Centro, Bungalow, Lexington Social House, XIV) serves as General Manager, while the cocktail program was masterminded by Dushan Zaric of New York's Employees Only and Macao Trading Co. 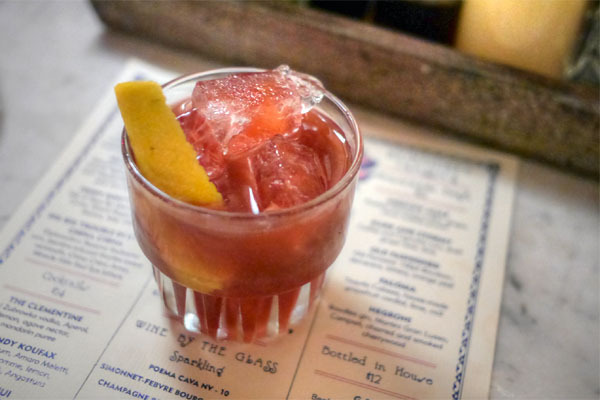 Day-to-day bar duties, however, are handled by a team that includes Chris Amirault (Eveleigh, MessHall), Una Green (Sotto), Jared Mort (Oldfield's, Sassafras), and Rosie Ruiz (Big Bar, 1886, Connie & Ted's). Harlowe occupies the former home of Crown Bar (and Tempest back in the day), but the interior has been thoroughly revamped by designer Bobby Green. 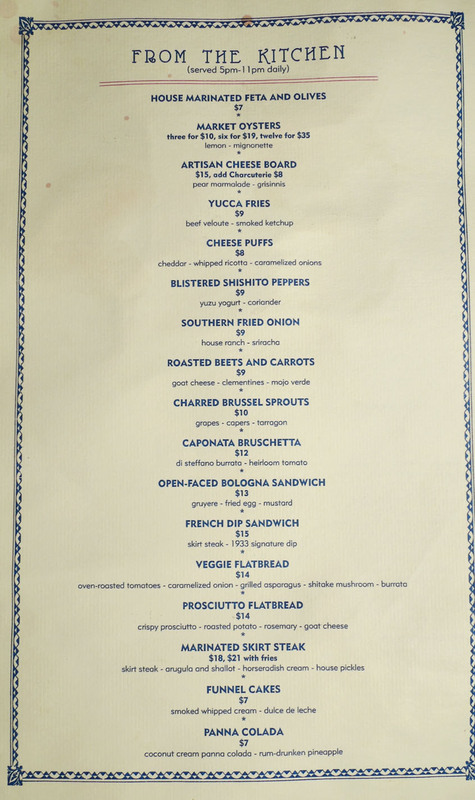 The space recalls what you might call an old Hollywood soda shop with its vintage-y fixtures, old-school portraiture, and turn-of-the-century banquettes. There's also an enclosed patio area out front. 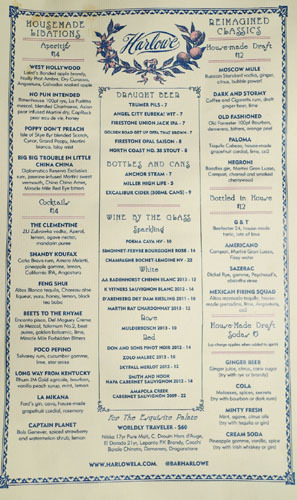 Harlowe's menu features about 20 cocktails, a quarter of 'em bottled, a quarter of 'em on draft. 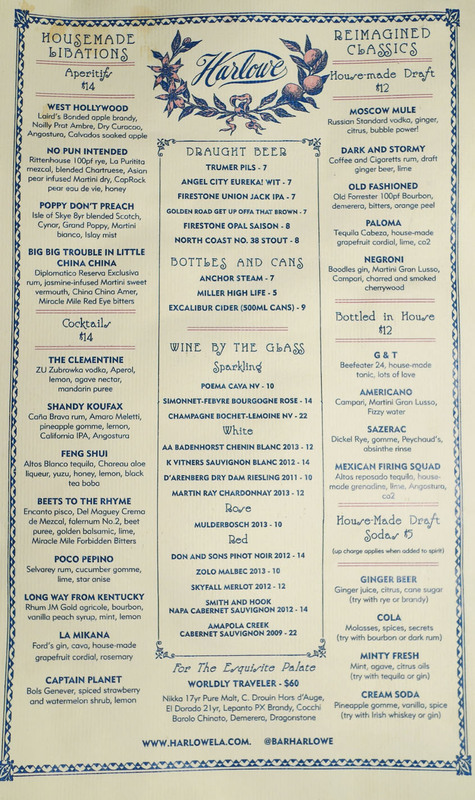 You also get homemade sodas, six beers on tap/a couple in the bottle, and about a dozen or so requisite wines. 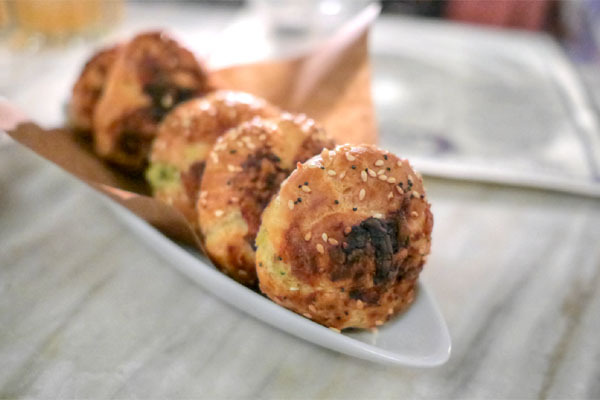 Food-wise, think elevate-y bar grub from consulting chef Eric Greenspan, with separate happy hour and late night selections. Click for larger versions. 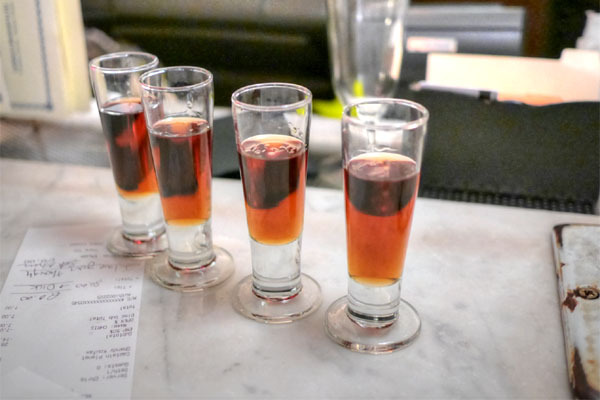 I began with an aperitif in the form of the No Pun Intended, a bracing, boozy, yet sweet-sour-spicy concoction underpinned by a backbone of honey, the mezcal imparting an air of gravitas to the drink--pretty cool. The Poppy Don't Preach, meanwhile, was much more viscous on the tongue, with a strong bittersweet, aromatic component backed by the potency of the whisky. 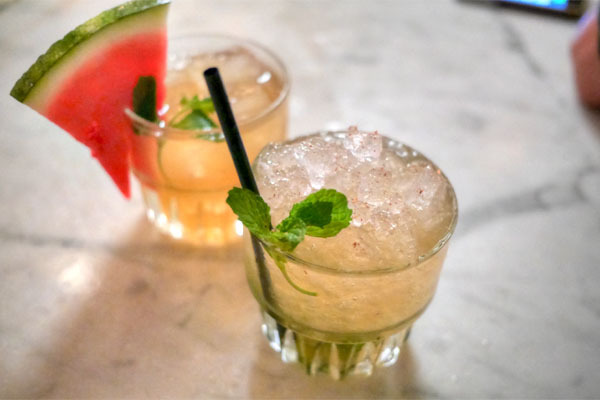 On the other hand, the Captain Planet was super bright and refreshing, with a juicy melon-y character intertwined with the zestiness of the jenever--perfect for summer. 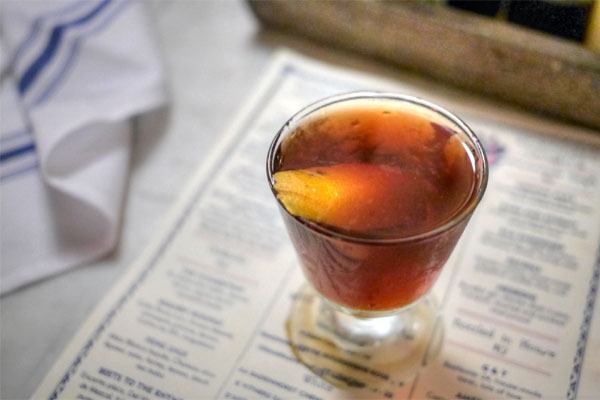 The Long Way from Kentucky was much heftier, natch, the interplay between the rum and bourbon tempered by the sweetness of vanilla-peach while mint and lemon added pleasant exclamation points to the drink. 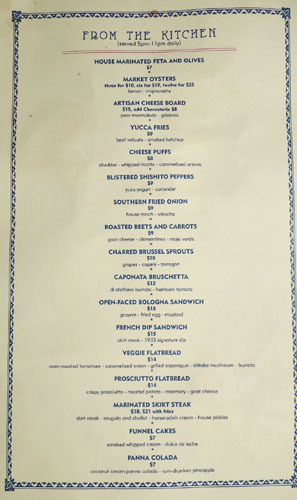 Cheese puffs were great texturally, with a strong essence of sweet onion, but seemed lacking in actual cheese. Somewhat of a letdown. Getting into a bottled cocktail now, the Mexican Firing Squad veered light and effervescent, a tangy, slightly bitter drink that had the booziness of the tequila shining through. 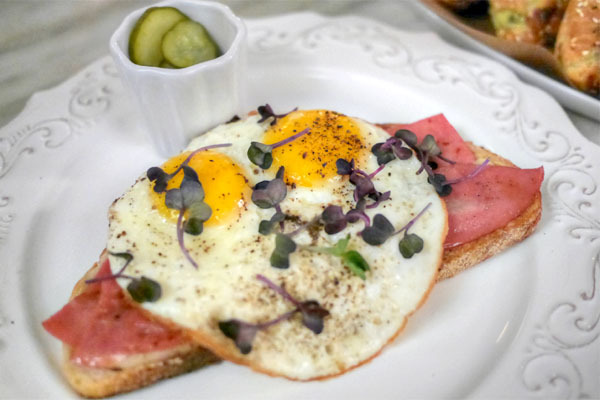 The bologna sandwich was a winner, a salty, satisfying mélange of egg-cheese-meat that was smartly set off by the tangy mustard and pickles. On draft was Harlowe's take on the Old Fashioned, a classic interpretation of the cocktail with a balanced presentation of boozy, bitter, sweet, and citrusy. Brussels were pretty good: bitter, charred, and amped up by the application of capers, all while the grapes imparted a noticeable levity to the dish. The long-monikered Big Big Trouble in Little China China managed to become my favorite cocktail of the night. I found it super well-integrated, with disparate notes of citrus, spice, and minty herbs all coming together cohesively over a base of Diplomatico. Wonderfully multifaceted, and one of the best cocktails I've had in recent memory. 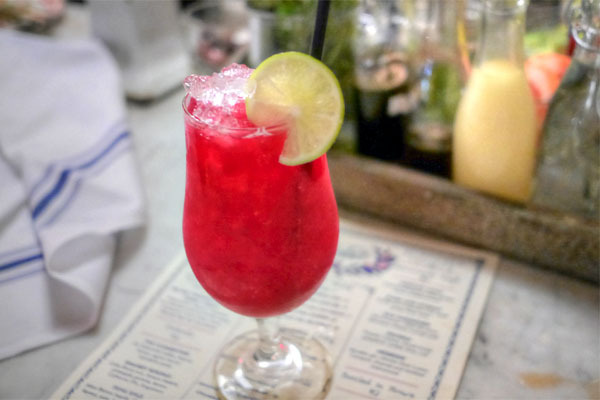 An electric shade of crimson and gritty in texture, the Beets to the Rhyme showed off the sweetness of the beet, set against a palpable tartness and spice, the mezcal lending a much appreciated smokiness to the fray. An easy drinker. 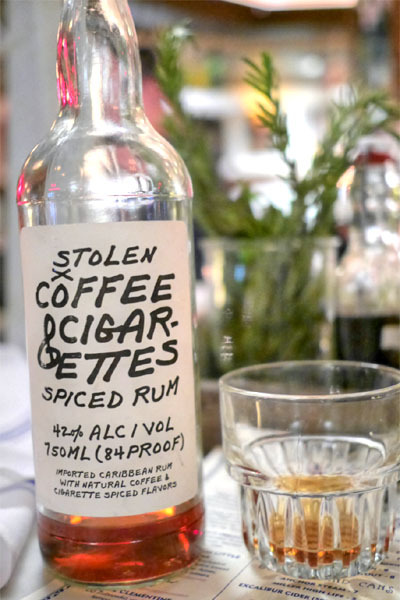 We saw a bottle of Stolen Coffee & Cigarettes Spiced Rum behind the bar, and Chris Amirault poured us a taste. It was delicious, with a smooth, harmonious balance of spice, coffee, smoke, and sweetness that left me thirsty for more. 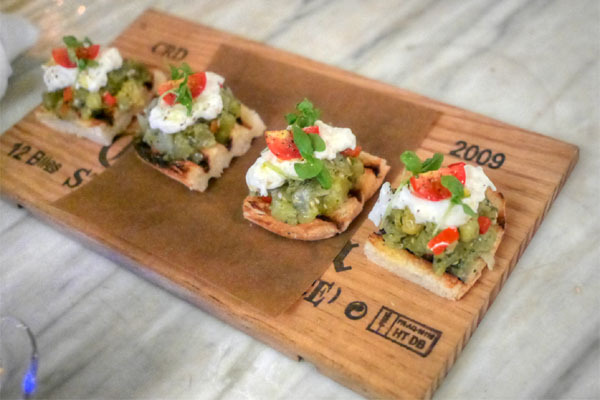 Here, bruschetta attempted to play the sweet-n-sour essence of eggplant against the cool, creamy nature of burrata, though the results didn't exactly wow me. 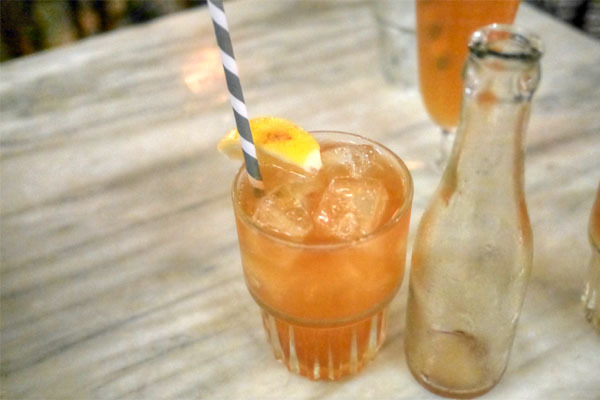 The Shandy Koufax is arguably Harlowe's most well-known drink by this point, and for good reason. A tiki-esque creation, it displayed a delectably tropical flair along with the rum, but the crux of the cocktail was the beer, which imparted a refreshing bitterness toward the back end that really brought it all together. Another favorite. 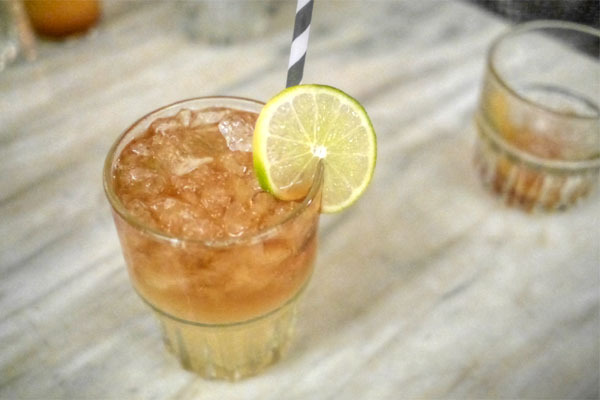 Harlowe's draught version of the traditional Dark and Stormy made great use of the aforementioned Coffee & Cigarettes, playing the sweet, spicy base of the rum against the bright notes of the ginger beer and lime. 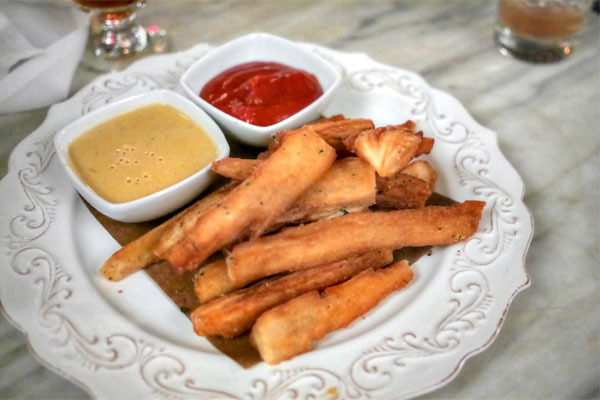 Yuca fries were delish. I was fine with the beef condiment, but was a little obsessed with the smoked ketchup, which was pretty much the perfect complement to the starchy, slightly sweet fries. Going back to the bottled stuff, the G & T was a tasty update on the classic drink thanks to the use of Beefeater 24 (made with tea), which imparted more depth and complexity to the drink's expected flavors. 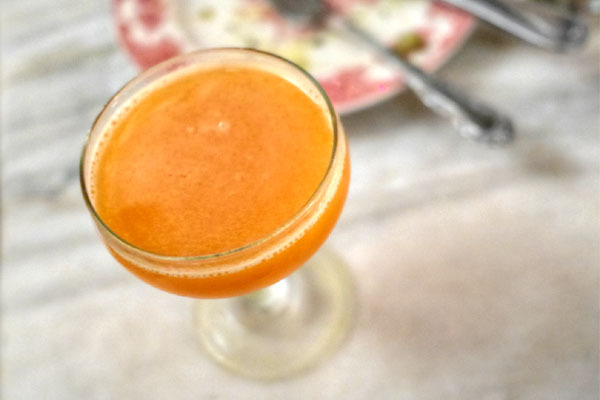 Last up was The Clementine, which showed off the sweet-tart mandarin, balanced by the bitterness of Aperol and the weight of agave. 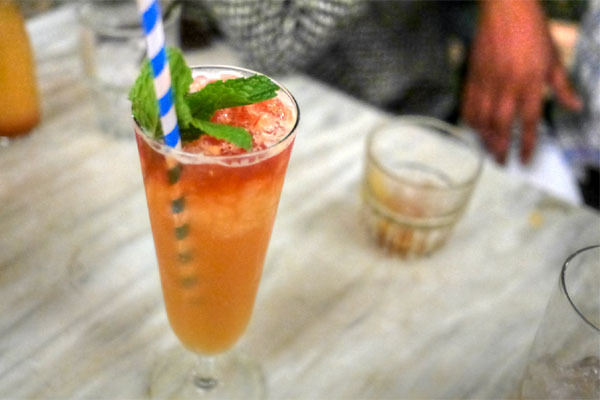 A bracing, almost astringent sort of cocktail. To close, Amirault poured us a round of digestifs. 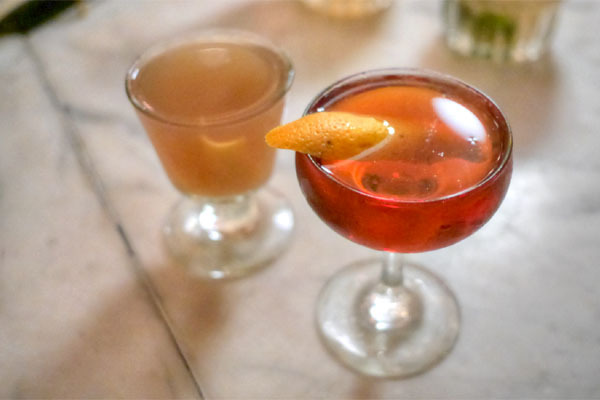 The whole conceit behind Harlowe was that you could have quality cocktails in a high volume environment, and to that effect, the place mostly succeeds. 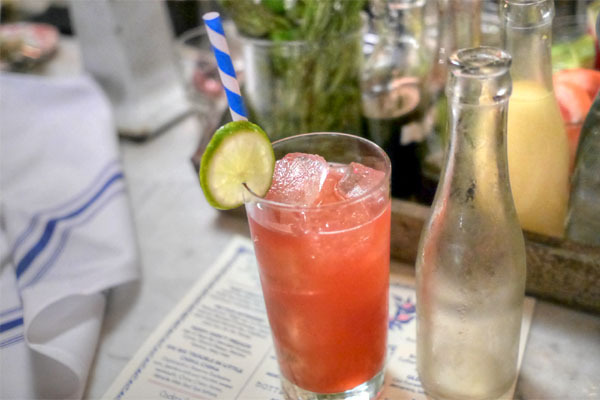 The drinks themselves were commendable, with some definite standouts, while the food was passable. Overall, a welcomed newcomer to the area with a nice, mellow, comfortable vibe. What a great post...and the photos are lovely.